Soooo...this pizza is really good. 1. Preheat your oven to 375 degrees. Add the cauliflower, vegan butter, 4 cloves of garlic, black pepper, cayenne pepper, cumin, and a teaspoon of salt to a medium roasting pan. Drizzle with 2 teaspoons of olive oil and roast for about 12 minutes. 2. Remove roasting pan from the oven and stir the cauliflower, adding a dash of salt or two if necessary. Return the pan to the oven and continue roasting for another 5 to 10 minutes, until tender and a little browned. 3. While the cauliflower is roasting, caramelize the onions: add the onions, 1/2 tablespoon olive oil, a few dashes of salt, and one garlic clove to a large pan. Cook on medium heat until tender and sweet, 15 to 20 minutes. 4. Grease a pizza pan and lay the pizza dough out on the pan. Drizzle with olive oil. Follow the baking instructions for the crust. You may have to pre-bake it for a few minutes before adding the toppings. 5. 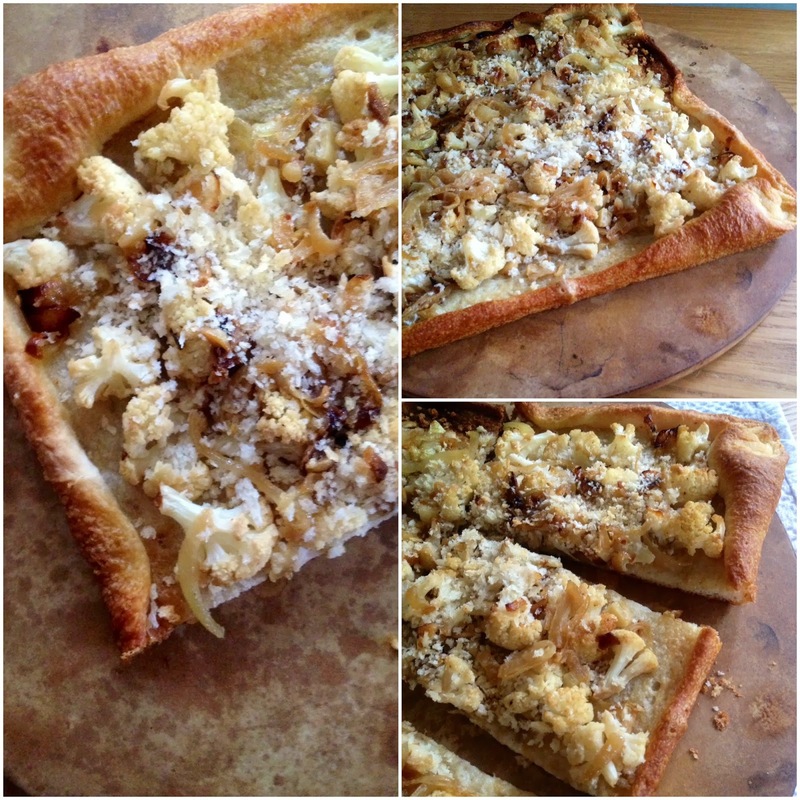 Once the onions and cauliflower are done and once you have pre-baked the pizza dough, add a layer of onions to the pizza dough, followed by a layer of cauliflower, and then a layer of onions. *I used Pillsbury Thin Crust Pizza Dough. The instructions said to pre-bake the dough on 400 for 5 minutes, add the toppings, and then continue baking for another 6 to 10 minutes. I haven't been eating breakfast much lately. (Gasp!) I know, I know. It's awful for my brain, my metabolism, and my all-around-life in general. However, this recipe is going to change that. I used cashews and sunflower seeds to give this recipe a bit of crunch, but almonds or walnuts would also work deliciously here. And who says you can't have chocolate for breakfast? Throw it together in less than 5 minutes, and you're out the door and ready to take on the day. Add the bananas to a medium bowl. Top with the peanut butter and sunflower seeds. Drizzle with the chocolate syrup and serve. It's nearing the end of October, and from seeing what the weather's like up north, I'm starting to get the feeling that Fall is finally upon us. Speaking of the change of seasons, this recipe makes for the perfect Fall treat. The chickpea puree is savory with hints of garlic and other umami flavors, which contrasts the sweetness of the butternut squash and brown sugar deliciously. The brown sugar butter topping adds just the right amount of decadence to the dish. This is definitely going on my Thanksgiving recipe list. Add more almond milk to turn it into a soup, or top it with walnuts to make it a little fancier. I didn't go through the whole how-to roast a butternut squash thing because I cheated and defrosted frozen squash, but if you're going to roast the squash, here's a good recipe from the Post Punk Kitchen. If you're low on time, buy frozen squash and defrost it by placing it in a saucepan with about 1/4 cup water and heat it on medium heat until the squash is defrosted. 1. Add the garlic, onion, 1 tbsp. of olive oil, chili powder, cayenne, lemon juice, and a few dashes of salt to a medium saucepan. Saute on medium heat until tender and a little browned, about 8 minutes. 2. Stir in the chickpeas, adding a little more olive oil, salt, and the garlic powder. Saute on medium heat for another 5 minutes or so. Set aside to cool for a few minutes before adding the mixture to your food processor or blender. 3. Add the chickpea mixture, almond milk, and another tablespoon of olive oil to the food processor. Pulse until smooth. 4. Next, add the squash to the food processor. Process the mixture until it's well-blended, adding more almond milk if necessary. 5. Return the mixture to the pan and cook on medium heat for another 5 to 10 minutes, stirring often. 6. 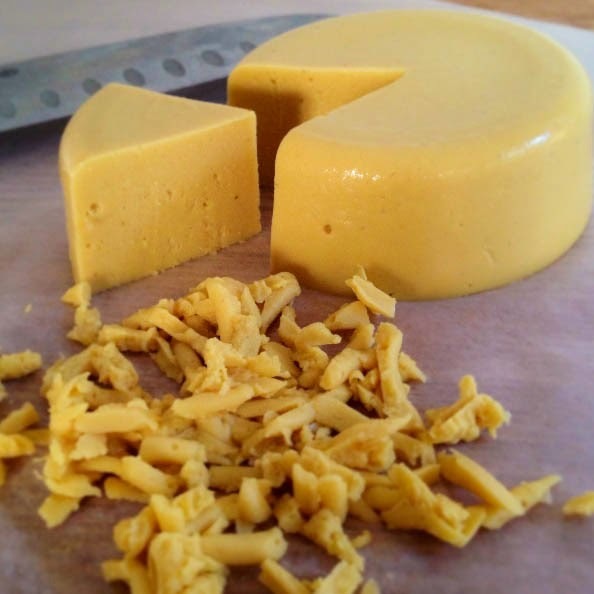 While the puree is heating up, melt the vegan butter in a saucepan. Heat for a minute or so, and then stir in the brown sugar. Heat on medium-low heat for 1 to 2 minutes. 7. Stir half of the brown sugar mixture in with the puree, and drizzle the rest over top of it when serving.